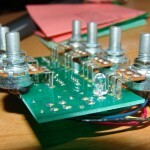 I build a lot of pedals. 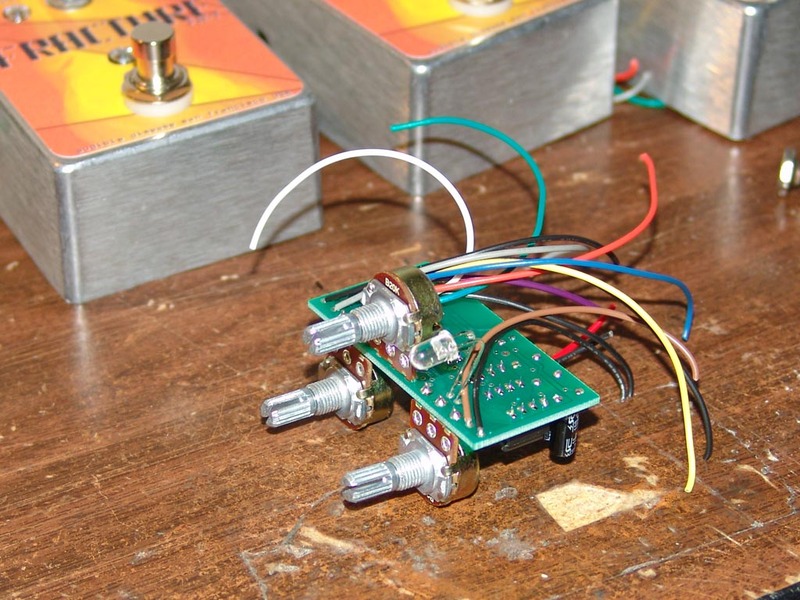 Probably my least favorite thing to do when assembling pedals is wiring potentiometers. 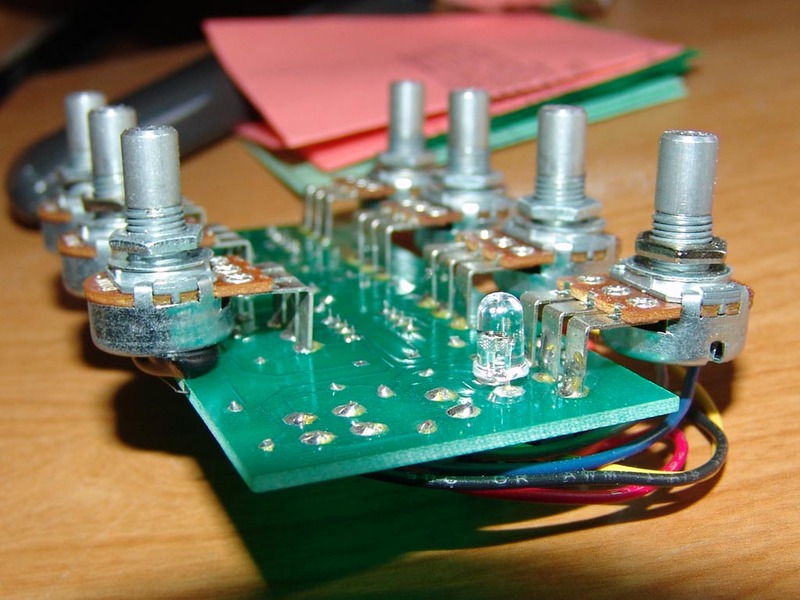 I found a great way to cut down wire cutting, stripping and soldering time greatly by just using the right angle PCB mounted pots as opposed to ones with solder lugs. Of course, I’ve had to reconfigure PCBs to accept the new-fangled pots but the pay-off is well worth it! 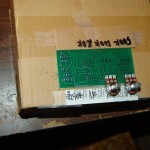 To make mounting easier when using the PCB mounted pots, I got a small cardboard box and made a cut-out in it a little smaller than the circuit board. Then I taped on strips of cardboard right on the edges of where the circuit board will actually fit in… the height of the cardboard strips keep the pots pretty close to a right angle when soldering everything down. Since the pots are usually a bit mis-aligned when you start soldering, I typically solder one of the legs in place with just a small amount of solder while holding the pot in place with my fingers. I make sure that the pot’s leg is flush with the pads on the PCB and everything is close to being centered and straight. After the solder cools in a second or two, I remove my fingers. Now technically this would be considered a “bad” solder connection because I might have moved my hand while the solder was cooling. Not to worry. That’s why you need to use a minimal amount of solder here. Just enough to “tack” the pot to the PCB. I then go to the unsoldered leg on the opposite side and “properly” solder each of the legs… and then the last one with the presumably “bad” solder connection. Now all three of the legs should be soldered on there properly! 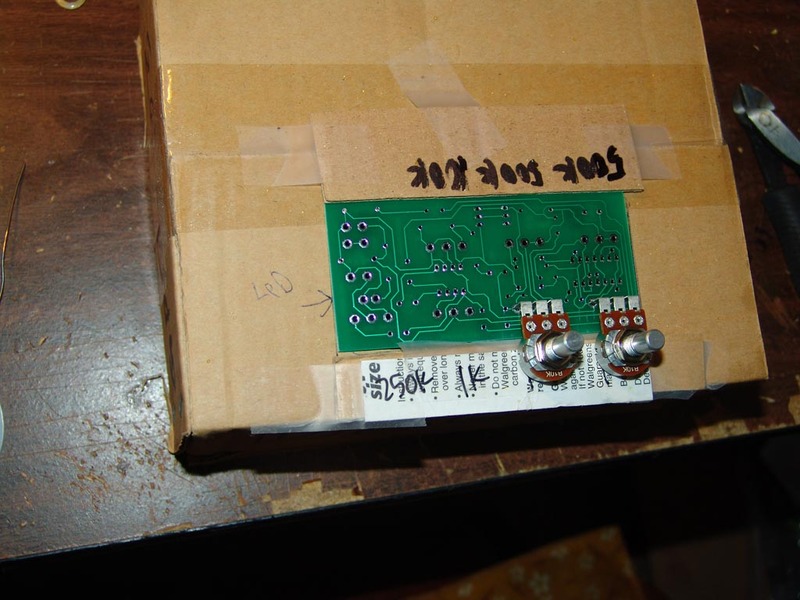 Sometimes, the back of the pots hang over part of the circuit board with pads and traces. Just to make sure nothing shorts out on the back of those pots, I usually squeeze a bit of hot glue between the back of the pot and the PCB just to be safe. Just a little dab will do ya! 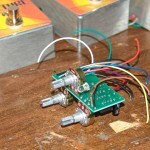 I also recently reconfigured a pedal to take PCB mounted pots with straight (i.e. not right angle) connectors. I’m still working on a more streamlined way to solder these, but so far it’s been pretty smooth sailing! The only thing left to tend to is to make sure that your enclosure has holes that match up almost exactly with the pots. Make sure to measure, double-check and measure again! I usually make the holes in the enclosure a little bit bigger than normal (but not too big, you don’t want the holes to be exposed under knobs!). It’s super nice not having to wire a bunch of pots!